Imagine a face of surprise, happiness, and elation all in one. This is what happens when someone sees one of our 5.5 x 8.5 Shipping Labels on their package. Not only are they excited about what's inside, but the bright label alone will make them excited. Whether it's a package for your business, or a present for your friend, these bright neon labels will grab attention and keep attention (ten-HUT!). 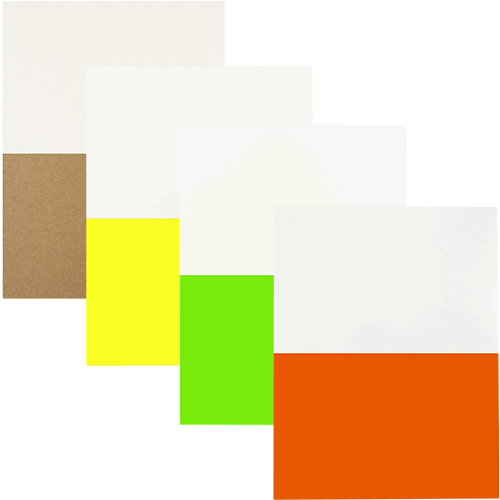 Available in five amazing neon colors, brown kraft, and white, you are sure to find one that fits the occasion you are shipping out to. Don't underestimate the power of a bright and vibrant label! Especially for your business. When you want to market your packages in a way that stands out, JAM labels are certainly your best bet. 5 1/2 x 8 1/2 Shipping Labels are sold in packs of 50 labels (2 per sheet). Use Avery Template 5126 in Microsoft Office for an easy layout and even easier printing.